Fishing in the local area has been excellent for bait and troll and some handy flyfishing too. Get out your gear and come fishing up here! How about this for a well conditioned brown from Eucumbene. Slavco Puplievski landed this 76cm long, 6.85kg (cleaned weight) brown on a bardi grub on the weekend. A truly fantastic fish. Lake Jindabyne:- Jindabyne reports have been ok for those who searched with wets on the weekend. Conditions for polaroiding have not been ideal but there still is the odd fish poking around. Sorry this is a bit late, Dad and I struggled on Jindabyne for three days. 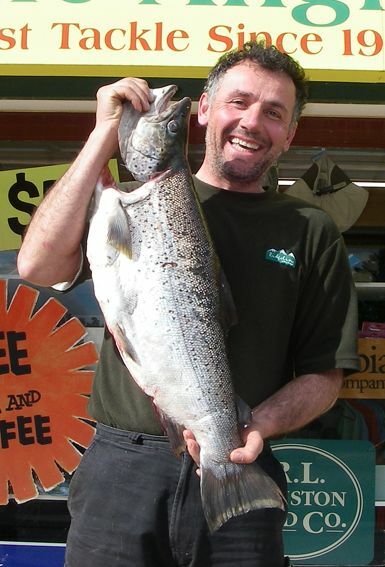 Fished Kalkite and the Eucumbene Arm and also Creel Bay for only 4 fish (2 Rainbows, 1 Brown and a Salmon) with the best going 1.1kg. Not a great strike rate despite the great weather. 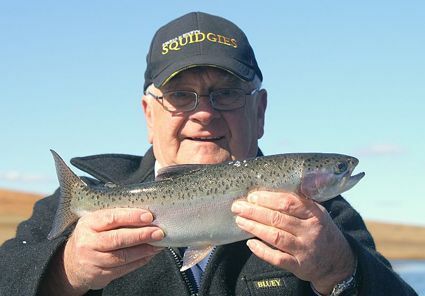 Only managed a short session on Eucumbene but got 4 fish in 2 hours trolling out the front of Yens Cove, all Rainbows. 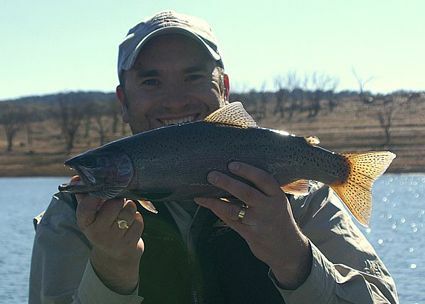 Should have hit Eucumbene instead of persisting with Jindabyne (I wanted a Brookie!). 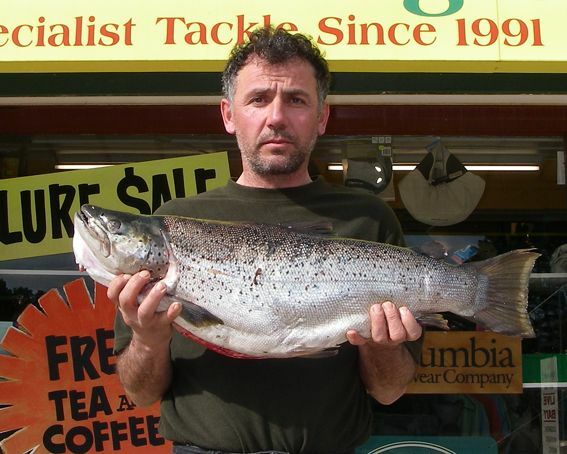 Fish mainly took a no-name 5cm Minnow in Spotted Dog and Gold Wing Tassie Devils trolled and cast. Couple of photos of Dad and myself with some of the Eucumbene Fish. *Steve Beadman from Wollongong had a good morning session with two rainbows and a nice brown coming in on leadcored tassies. Each were caught on different colours, being # 54, #36 and # 63 being the colours taken in the Kalkite area. Bait fishing has been excellent with some nice reports of rainbows being taken on powerbait and grubs plus the extra large brown in the headlines again pictured below. FAT!!! Powerbait is now back in stock after a short supply issue.